It's almost there ! Our new app is currently being tested here in France and Belgium, and we can already give you a sneak preview of its main features. BistroTouch is an integrated software that helps you manage any kind of restaurant, from the snack bar to the most renown places of Grande Cuisine. BistroTouch is more than a piece of software, it's four! BistroTouch Salon runs on an iPod Touch/iPhone and is designed for waiters. It helps them taking orders, in a way that will make your summertime student extra seem like an experienced professional, and your customers happy. - succeed the challenge to serve a coffee with the dessert if the customer asked for it. - alerts if a table has not been visited for some time. - receive information from the kitchen : depleted dishes, sales priority and more. - information about recipes, wine… so the customer has a clear explanation if he/she asks for it. And why not show him a picture? - manage and take orders. - open the cash register drawer. BistroTouch Cuisine runs on an iPad and helps managing the preparation of the dishes. - information on the room: reservations, status of tables. - service check list. This feature will help preparing the kitchen before the service. - alerts when a preparation should start, or when something needs to be done. - stock management : each time a dish is prepared, the corresponding stock of each ingredient is decreased, which allows BistroTouch Management to place accurate orders. BistroTouch Central runs on a Mac or a PC, and helps you do the rest. - manage your dining room configurations. - set up the menu. - describe the dishes and the recipes. - manage providers and products. - place orders or print a shopping list. - forecasts : specify if you expect a service to be full or on the contrary if not many people are expected. This will ensure you have enough personal when needed. - personal : plan your employees and extras, check their working hours, take note of their questions/requests. - publish the menu to the web, and propose online reservations and newsletters. - edit invoices, and export to your accountancy software. 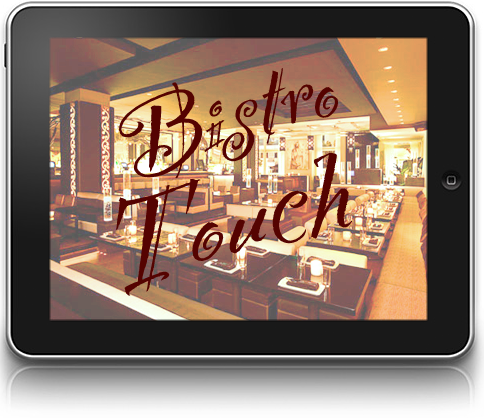 These are only the majors features of BistroTouch, there are many others. BistroTouch is currently in a beta phase, and will we released later this year. Although we have already enough beta testers and that they're so enthusiastic that we probably won't add features for the first version, we are curious to know your opinion, and most of all what you think would be the key feature to add in a later version. We are currently looking for distributors wholesalers in the catering/hotel business, as well as integrators. Around the world! Do not hesitate to contact us. Do you wish to be kept informed? Please leave a comment or your feature requests. We're taking every opinion seriously.